Another Amazon Archives exclusive re-imagined cover of this issue by the late great artists Al Rio is available in the gallery. Ralph Dibney, otherwise known as the Elongated Man is debriefing his fellow Leaguers on the most recent ‘trial’ faced by Wonder Woman. His tale begins on a New York street, where a beautiful woman is crossing the road in front of an oncoming truck, seemingly oblivious to the danger. Ralph is in a nearby taxi and can see the impending danger. 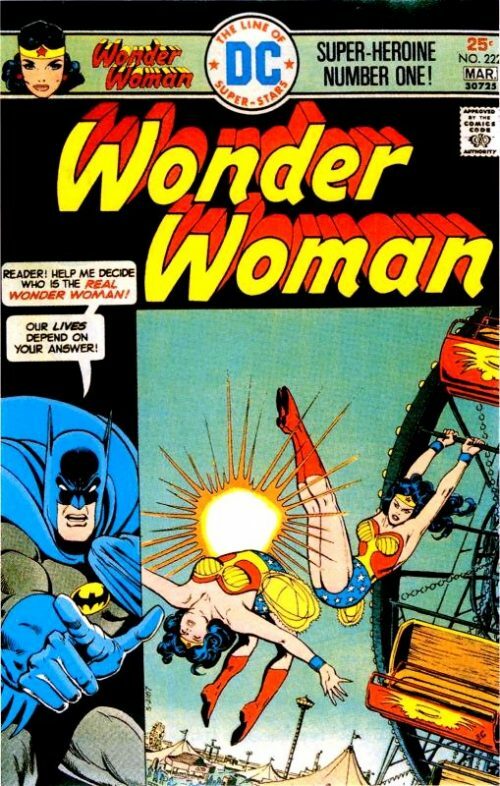 Suddenly, Wonder Woman appears in the skies and, attaching her tiara to the end of her lasso, throws it around a lamppost and hooks it around the nose of the truck, slowing it to a halt just in time. As Wonder Woman approaches the woman to check she is all right, the woman charges at her, enraged that she stopped the truck! The surprised Amazon quickly uses her lasso to compel her to go home peacefully. 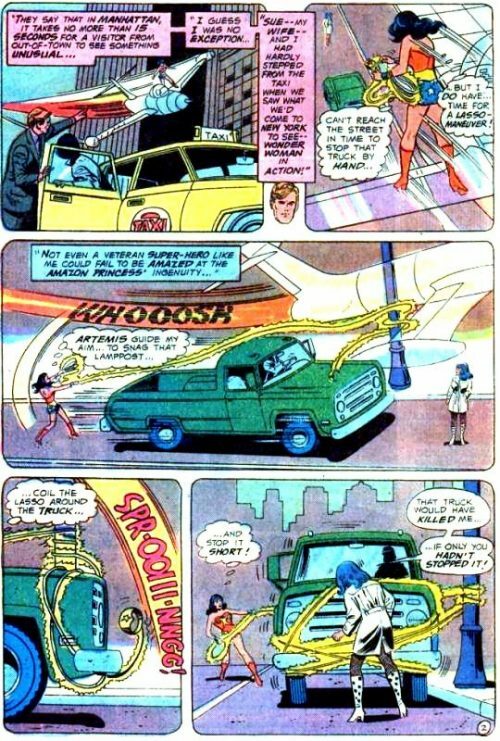 Wonder Woman puzzles as to why the woman seemed almost delighted when the the truck almost killed her and yet became angry enough to attack the Amazon Princess after she had saved her life. A week later, Diana is in a meeting with Morgan Tracy at the UN Crisis Bureau. Apparently, the UN is due to host the World Conference of Feminist Woman but the disappearance of two internationally famous feminists has caused concern. As Diana questions him more, Tracy reveals that they actually ‘vanished’ into thin air! He instructs Diana to keep track of the whereabouts of the American Delegates to ensure that they also do not vanish. The first name on her list is a tennis star by the name of Betty Jo Kane. The following day, Betty takes part in a tennis tournament in front of a packed crowd against a chauvinist hustler named Willy Wrigley. Halfway through the first set Wrigley lobs the ball and Betty finds that she is not quick enough to get to it in time. For an instant she looks dismayed and then vanishes. Betty’s feminist fans become angry and accuse Wrigley of cheating. 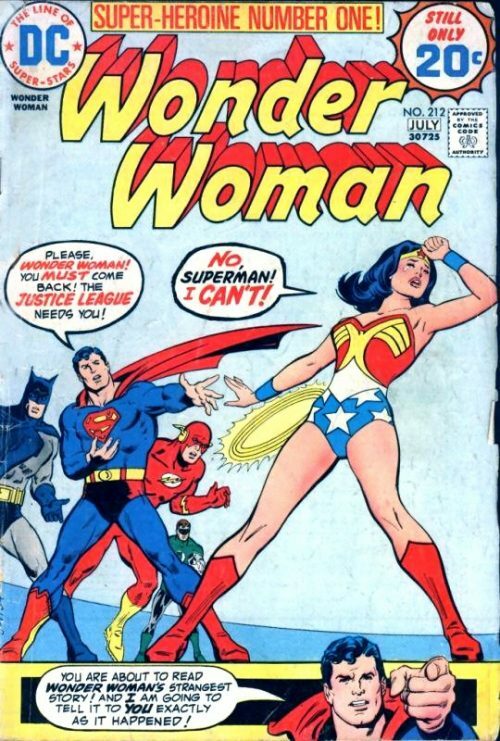 Wonder Woman arrives to lasso the militant mob, commanding them to stop fighting. Then she asks one of the security guards to take her to Betty’s locker room. Searching through the tennis player’s things, she hopes that she will strike lucky and find some sort of clue. She pulls out an advert for a beauty parlour called Consciousness III Salon, and wonders what a liberated woman like Betty Jo would want with a sexist establishment such as this. Returning to her apartment as Diana Prince, she checks through the newspaper and sees that Margaret Matthews, the former Attorney General’s wife, is scheduled to cut the ribbon at the grand opening of another Conscious III branch the following day. As Matthews is the second feminist on her list, she realises that this must be the connection and decides to attend. Next day, the ceremony goes without a hitch and Diana enters the salon to see the normal day to day workings of a beauty parlour. Ralph continues to tail her. Suddenly, she hears a shout from Matthews and looks into the room from where the sound came from. She sees Matthews looking in horror at the mirror, her hair a ghastly green color! As she threatens to sue the male beautician responsible for the shampoo she suddenly vanishes from her chair. Unaware that Diana has witnessed this, the man speaks into a radio and reports that the ‘transmission’ of Margaret Matthews has been completed. All of a sudden, however, he finds the radio knocked from his grasp by a karate chop, which Diana swiftly follows up with a kick to his stomach. 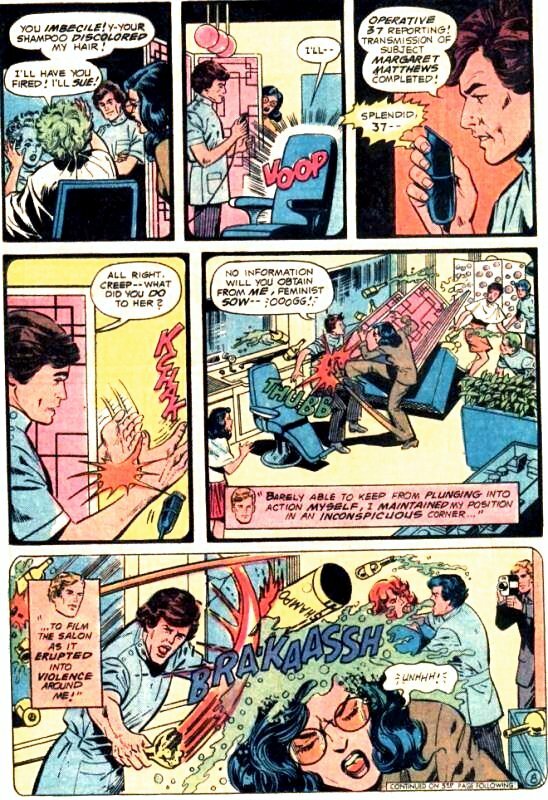 The man retaliates and manages to smash a bottle of shampoo over Diana’s head. She, in turn, then judo throws her attacker onto the floor. As she attempts to wipe the soap suds from her stinging eyes though she disappears! As Ralph witnesses this, wondering how on earth he can follow Diana, he realises that he too has soap suds on him from being close to the action and begins to vanish too. Participation in the government of Xro is exclusively the right of men. The females, who are physically stronger though mentally inferior are therefore kept as slaves. One day however, two of the slaves gained illegal entrance to their master’s laboratory and using the equipment there discovered the existence of Earth, where men are as strong as women and the women are free. They decided to use the Teleporter to go there and learn more, but when they arrived their minds underwent a strange transformation. When the Xro females were transported to Earth the dimensional displacement caused them a reversal of emotional response. So when, after arriving, a falling chunk of masonry accidentally plummeted towards one of the women she simply stood there and pointed to it, smiling. When she was killed, the other woman again laughed to herself – the complete opposite of the emotion that would have been expected. When the surviving female subsequently returned to Xro, she incited the slaves to rebel using the ideas and slogans seen on Earth. The male government was unable to suppress the revolt but realised that the feminists and their attitudes on Earth were the root cause of the problems on Xro. They therefore planned to transport those females responsible back to Xro, where the emotion reversal affect would affect them too. They would then address the rebellious women and convince them not to rebel against their masters but to submit instead. 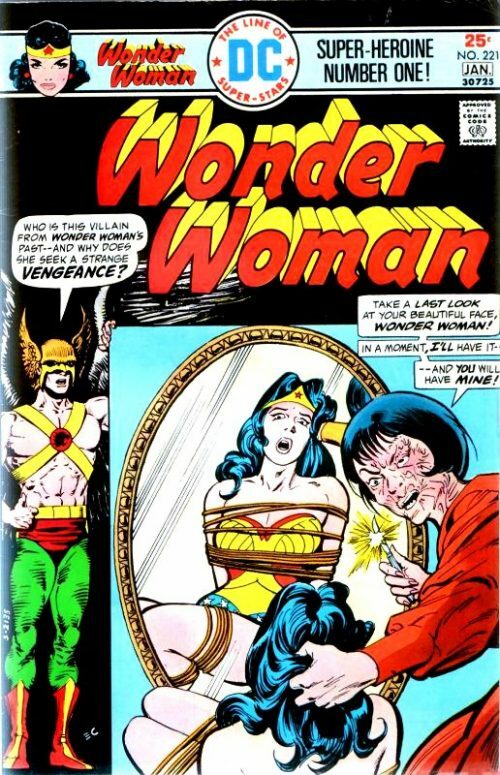 Wonder Woman surmises that the beauty parlours are fronts for the operation and that the shampoo has a special chemical. Mchsm confirms this, and explains that it enters the blood stream through the scalp, reacting with the adrenaline in the woman’s system when she becomes anxiety ridden. This then sets off a molecular chain reaction which teleports her to Xro, as happened with Diana. With Wonder Woman under armed guard, he then instructs one of the feminists from Earth to begin addressing the women in the square down below. 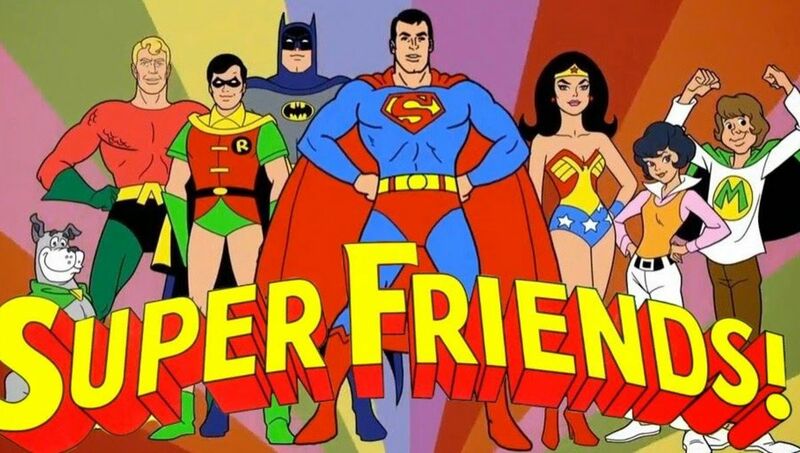 He smiles to himself, turning to Wonder Woman and telling her that while these addresses will help, they are not as persuasive as her very own magic lasso. He orders her to hand it over and she replies that she is only to happy to do so. Struggling against the effects of the emotion reversal however, she manages to resist the instruction. He orders his men to shoot her dead but she uses her bracelets to repel the bullets. 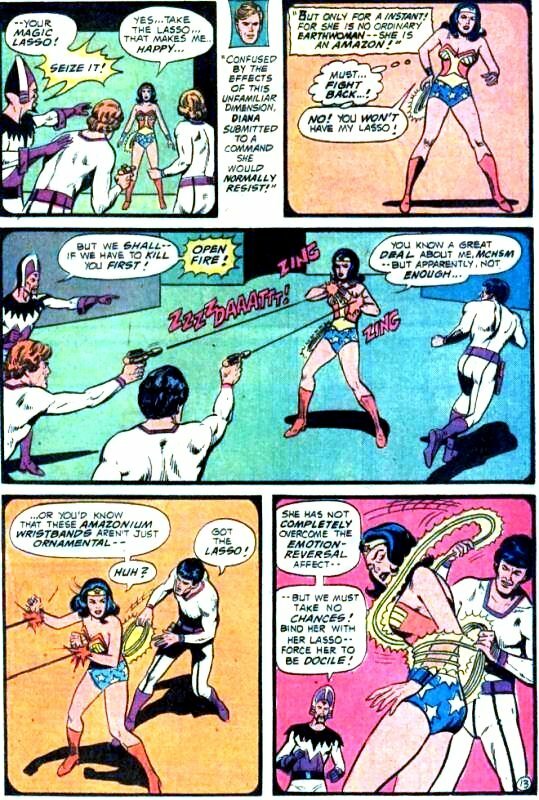 However, while her attention is focused on her attackers, one of the men sneaks around behind her and grabs her lasso. Quickly, he wraps the golden rope around the surprised Amazon. Once bound, he commands her to cease all further resistance and to fall asleep. As she crumples to the floor he prepares to quickly remove the lasso but she suddenly throws him across the room, having tricked him. With her lasso back, she wastes no time in disarming the guards, before throwing her tiara across the room to shatter the bars of the other women’s’ cage. Meanwhile down below, the women of Xro have become an angry mob, demanding the death of their male oppressors. 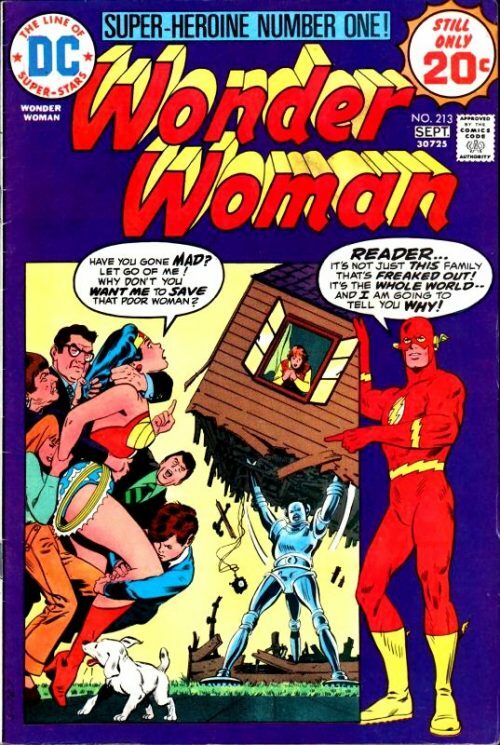 With their angry shouts filling the room, Wonder Woman clouts Mchsm around the head, telling him that he will soon be facing mob justice. Swearing that he would rather die than be dominated by women, he activates the countdown for the palace self destruct mechanism. 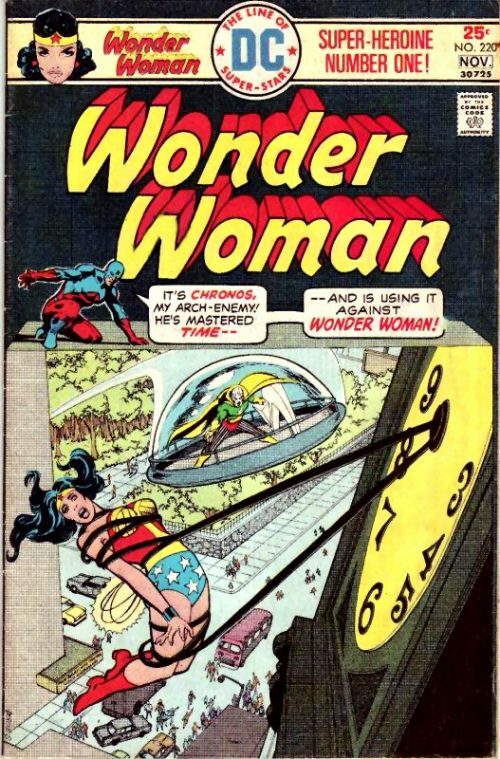 Wonder Woman races downstairs to warn the mob of the impending explosion and then returns to the other Earth women telling them to climb into the Teleporter. But they reply that they wish to stay and she remembers that they are still suffering from the effects of the emotion reversal. She therefore wastes no time and lassos them. Although even the power of the golden rope is not strong enough to compel them all, she uses it instead to literally drag them into the Teleporter. Ralph manages to follow a few seconds later. Back on Earth in the beauty parlour, the dimensional link causes the salon itself to begin to destroy itself and Wonder Woman quickly manages to get the other women onto her nearby invisible jet. As they watch, the salon explodes, while across the dimensions, Mchsm’s palace does the same thing. 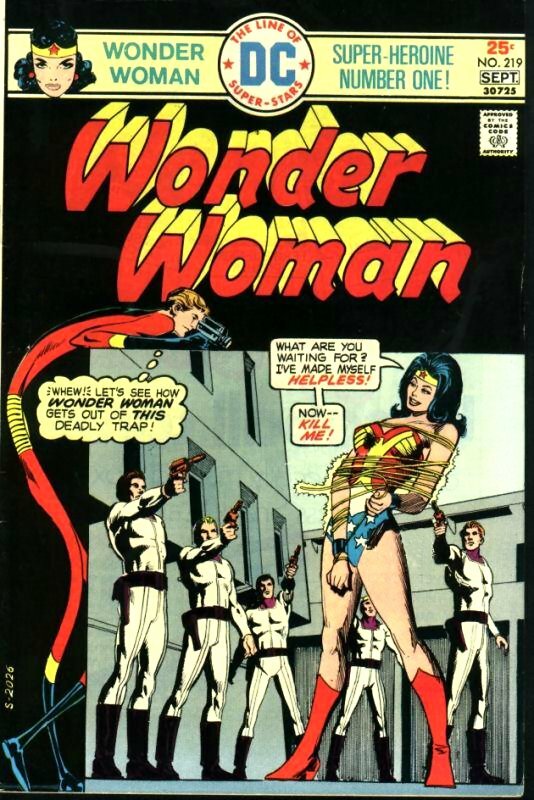 Before returning the women to the UN Conference, she uses her lasso to command them to forget that she and Diana Prince are one and the same person.